I don’t think any husband and wife get married not wanting to be best friends with their spouse. Everybody wants that! Well, if everyone wants that, how come not everyone has that? Well, to be honest, there are probably too many reasons to list. BUT, I do have a shorter list that might just help you get to the #relationshipgoals you’ve always wanted with your spouse! This may sound like a no-brainer to some, but to others, opening up sounds like trying to feed a toddler spinach. Not gonna happen. If you know that this area has some room for improvement in your marriage, they key is to lead by example- subtly. I’ll say it again, subtly. Now, that may sound counterproductive if we’re trying to foster an open environment but trust me, you’re not going to get there by prying open the doors to your husband’s heart. It’s going to take time, trust, and repetition to get to a point where you and your husband feel comfortable talking about things that would make others uncomfortable. You might be thinking, “Huh? What does that even mean?” Let me explain by painting a picture. At the beginning of the day, your husband asks if you could run a package to the post office because we won’t get the chance to today. You say “Ok, sure.” And that’s that. You go about your day and when it comes time to go to the post office, you decide to stop at the grocery store first and pick up a few things for dinner and swing by the PO on the way home. While in the grocery store, the toddler poops his pants and simultaneously throws a tantrum. Now, it takes everything in your power just to get the essentials on your list and get home, either forgetting or putting off going to the PO- it’s not worth it right now and the hubs will understand. Now, a few days later you ask the hubs to pick up dog food on his way home from work or else the dog will starve (or at least act like it). 5:45 rolls around, Husband comes home, no dog food. You’re frustrated because your husband had one. job. You see, it can be really easy to let ourselves off the hook when we drop the ball because we knew we had good intentions. We would have gone to the PO but life happened and we had to put it off. We might not be sure why the hubs didn’t get dog food, but we know it’s pretty typical of him to drop the ball. But hey. If we can manage to put ourselves in our husband’s shoe and image why he may not have arrived home with the dog food- or better yet, ask– we might just end up understanding and being ok with it. Husband feels understood and appreciated, you’re not mad. I’d say that’s a win, win! If you feel like a completely different person than your husband, we’re going to need to work on that. Chances are there are at least a few things you can agree on and both like. This might take trying some new things or dusting off a few of the things you used to do together, and no matter what, it’ll probably take some work, but it’s worth it! Josh loves soccer. When we got married, I liked soccer. It was ok. But you bet I’m watching every game with him. I love taking photos and editing them to make them look pretty. Josh can appreciate a good photo, but let’s just say his creative juices run a little dry. Even still, he’ll get out of the house and take photos with me and dress up and hike through the woods for a great shot if I ask him to. The point is, you may not naturally like all the same things, you can take interest in some of the same things. Just enough to understand what your spouse likes, why they like it, and have an intelligent conversation about it. A+ if you find a few things you like and are both passionate about! This is basically a BFF’s number 1 rule. If you and your husband are always saying “What? !” to each other because you have no idea how you offended them, this is going to take some work. Understanding your spouse’s cues takes time, patience, and quiet. Quiet, because picking up on cues means listening and observing, which is typically difficult if we’re already talking. The goal here is to be able to give your husband a subtle look at a social event and have him know exactly what you’re thinking, or vice versa. Or to be able to hear him have a conversation with someone else and understand exactly what he’s thinking, even if it’s different from what he’s saying. Now, you may not even be able to begin to think about trying these things with your spouse because there is a past hurt that still stings. 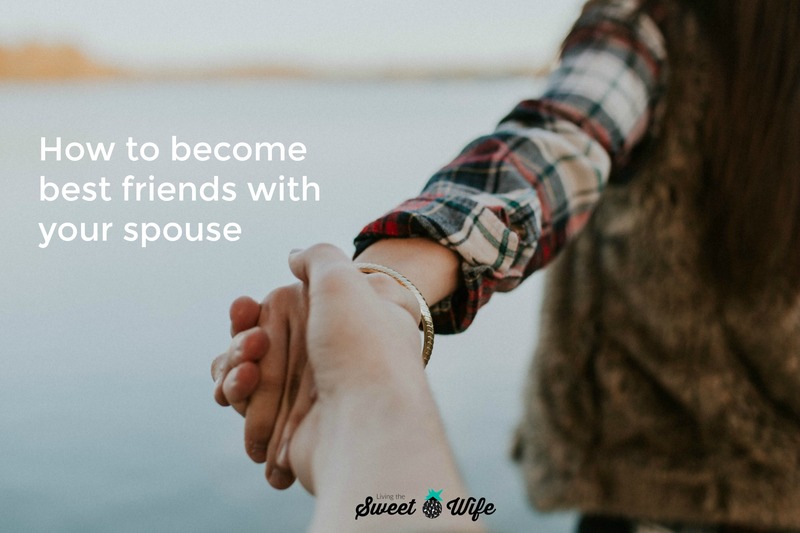 You may want so badly to be close to your husband and think of him as your best friend, but you know that you both have a few hurdles to jump over before you get there. That’s ok. I feel for you and you’re not alone! I know of thriving marriages that looked completely hopeless 20 years ago. There is hope for any and every marriage where Christ is the focus for the husband and the wife. When Christ is the focus, something amazing happens. The focus starts shifting away yourselves and onto things that are uplifting, joyful, helpful (ie. pleasing to God). Christ can not only give the power to forgive after a very hurtful wrongdoing, but He can also bring restoration and healing to anyone. If you choose to seek Christ with your spouse, your relationship with your husband will grow deeper than ever before and you will be connected on a much more meaningful level- although this can’t be your reason for wanting Jesus. 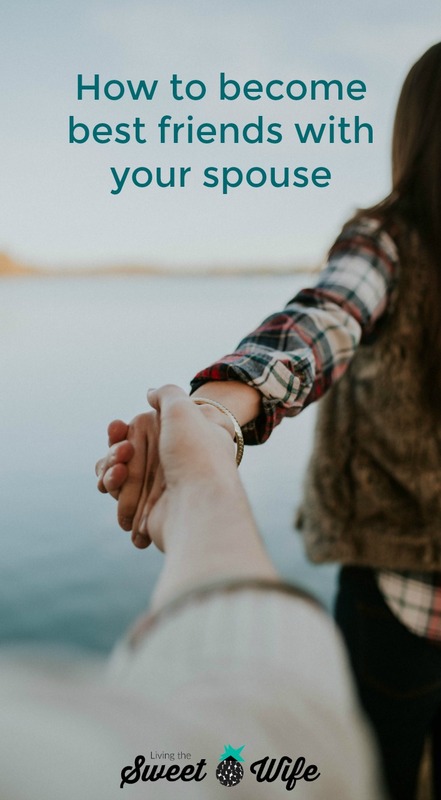 Having a deep, spiritual connection with your spouse is something that will happen as a result of you both desiring Jesus and loving who He is and desiring to be like Him. Does all that makes sense? Please let me know if it doesn’t. Anyway, lovely ladies, what are your favorite tips to stay best friends with your spouse and what are your favorite things to do with your bff? Leave your thoughts in the comments below!! Knowing each other’s cues is huge. I know when he’s overwhelmed as an introvert in a loud, extroverted situation. He knows when I need a break from the kids and time to myself. It’s a balance that keeps us both sane. Also, forgiving. That’s big. Not just forgiving, but not bringing those things up in later situations and arguments. We have a rule that we can’t do that. It makes such a difference in the inevitable arguments that come up in marriage.